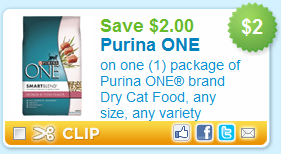 Save $2.00 on one (1) package of Purina ONE® brand Dry Cat Food, any size, any variety. Found under Pet Care, page one, using zip code 90210. Have realistic expectations: While I try very hard to only provide links to legitimate offers, sometimes the freebies still don't arrive. This could be because the company did not having a large enough supply to cover the response they got. It is also possible that a spammer has set up a site to gather email addresses (another important reason to use an alternate email account) and never intended to send you a freebie at all. Be aware that this can happen and although I do my best to avoid such sites, it is a part of getting freebies over the Internet.